Headlight upgrades can be aesthetic, practical, or both. Upgrading your old halogen headlights to LED or high-intensity discharge (HID) effectively swaps out dull, yellow beams for a colder white or blue, and doing it the right way can also give you brighter headlights that effectively improve your night vision without blinding other drivers. Other upgrades, like bumping up the brightness of your halogen capsules, or simply reconditioning your headlight assemblies, are purely practical. These upgrades won't change the look of your car at night, but good headlights reduce the risk of accidents during twilight and nighttime hours, so they're still worth considering. If you're looking for brighter headlights, it's important to ask if you want headlights that look cool, or if you want headlights that make it safer to drive at night. Brighter headlights, and especially cold white or blue headlights, look really nice at night, but brightness is only one part of the equation. All that extra light has to be aimed at the road, and not into the eyes of oncoming drivers. Most headlight upgrades are simple enough that you can do them at home without too much prior experience, but some are more complicated than others. Some headlight upgrades are also easier or harder depending on the vehicle you drive and the type of headlights that it came with from the factory. Replace your worn headlights or capsules with new ones: Headlights grow dim over time, so replacing old capsules will usually result in a brighter beam. Some headlights, like long-lasting HID bulbs, can actually lose as much as 70 percent of their intensity by the time they finally burn out. Upgrade your existing capsules to a brighter version: For the easiest possible upgrade, choose direct-replacement bulbs that are brighter than the original capsules. Some aftermarket capsules can be more than 80 percent brighter than your headlights were when they were new. Keep in mind that brighter headlights are often rated at shorter lifespans. Clean and restore your headlight lenses: This is more difficult than just replacing headlight capsules, but you can still do it at home. When headlights look foggy or hazy, it's usually because of buildup that you can remove. This makes your headlights look nicer, and can also increase their brightness. The easiest way to recondition a headlight lens is to buy a restoration kit. Upgrade to HID headlights: HID headlights are significantly brighter than halogen factory headlights. They still use capsules, but you can’t just unplug a halogen and plug in an HID. Retrofitting a vehicle for HID headlights requires the installation of ballasts and may also call for new projector headlight assemblies. If you find capsules that are marketed as xenon, but designed to install in your existing headlight assemblies, they may not be real HID capsules. Upgrade to LED headlights: LED headlights are typically much brighter and last longer than factory halogen bulbs, and direct replacement LED headlight capsules may fit in your existing headlight housings. However, installing LED capsules in reflector housings usually results in a poor beam pattern. Projector-style headlights often work better with drop-in LED capsules, but you may want to do further research on your specific make and model. When you look at what really makes headlights work, the two most important things to consider are brightness and beam pattern. The brightness of a headlight bulb or capsule is usually measured in lumens, and it literally refers to how bright the bulb is. Headlight beam pattern refers to the swath of light that headlights create in the darkness, and it can be just as important as brightness. The beam pattern is a product of the reflector and lens in a typical headlight assembly. Other headlights use projectors instead of reflectors. If your beam pattern is fuzzy instead of sharp, or it illuminates the wrong part of the road, it doesn’t matter how bright your headlight bulbs are. Installing brighter bulbs will just shine even more light in the wrong place. Most headlight upgrades focus on brightness, but you can’t ignore the beam pattern. For instance, some drop-in headlight bulb upgrades can result in a fuzzy or misaligned beam that doesn’t illuminate enough of the road or may even blind oncoming motorists. The most important thing to remember is that if your car came with halogen headlight capsules in reflector headlight assemblies, you should look for brighter halogen capsules. Installing HID capsules in a reflector headlight assembly will result in brighter headlights, but the beam pattern is typically awful. In one study performed by the IIHS that looked at multiple headlight configurations in 31 vehicles, only one out of 82 actually made the grade. So even if your vehicle is relatively new, and your headlights seem bright, an upgrade could still make a world of difference. Simply adjusting your headlights so they aim in the right direction can also help a lot. Are Fog Lights an Upgrade? Brightness and beam patterns also play into fog lights, which are designed to illuminate the road directly in front of a vehicle. The basic idea is that in situations where regular headlights would reflect back at the driver and create glare, fog lights won’t. So unless you spend a lot of time in foggy conditions, driving very slowly, fog lights probably aren’t an upgrade worth looking at. If you do a lot of driving in the very specific conditions that fog lights are designed for, then you may want to consider installing some aftermarket fog lights. While it’s easy to think of a headlight capsule as something that simply works until it burns out, the reality is far from that kind of binary absolute. Headlights actually grow dimmer and dimmer as they age, but the process is so slow that it usually goes unnoticed. 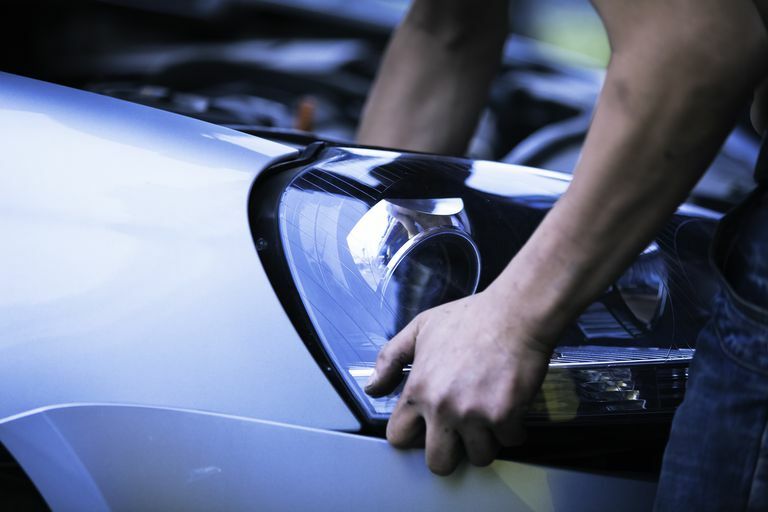 Most drivers wait for a headlight capsule to burn out before replacing it, but this is one case where being proactive has a number of benefits. Replacing your headlight capsules early, before they burn out, ensures that you won’t ever have your headlights cut when you’re driving at night, but it can also act as a stealth upgrade. Different types of headlights age differently, so it isn’t always obvious when a replacement is called for. Some will grow more and more yellow as they age, while other headlights will just appear to dim without the color of the light changing much. In any case, if your headlights seem noticeably yellow or dim, installing new headlight capsules will improve your visibility at night. Replacing worn out headlight capsules is a very easy process that just about anyone can do at home. In many cases, it’s a simple matter of unplugging the capsules, undoing the clip or collar that holds each capsule in place, and swapping in new ones. In other cases, you may have to work a little to gain access to the capsules. When you do replace old headlight capsules with new ones, it's important to do them in pairs. If you replace one capsule, and not the other, you can end up with an uneven beam pattern that both looks bad and makes it more difficult to drive at night. If your vehicle has separate high beam and low beam capsules, you should replace both high beam capsules at the same time, and both low beam capsules at the same time. Since each set illuminates independently from the other, you don't need to replace all four at once unless you want to save some time. The simplest headlight upgrade is to replace your factory headlight capsules with direct replacements that are designed to be brighter. These replacement capsules are the exact same size and shape as the original headlight bulbs, and they also use the same basic halogen lighting technology. When you upgrade your headlights with brighter capsules that are the same basic type of bulb, it’s often referred to as a drop-in upgrade. This type of upgrade literally just consists of removing the old capsules and installing the new ones. The great thing about replacing halogen headlight capsules with high performance brighter halogen capsules is that brightness is the only difference. These capsules have the same power requirements and work with your existing headlight assemblies to create the same basic beam pattern. Like replacing worn out headlight capsules, upgrading to brighter versions should also be done in pairs. The next easiest way to upgrade or improve your headlights only works if your headlight lenses look foggy. This foggy appearance is usually built-up oxidation that can affect both the brightness and beam pattern of your headlights, but you can remove it with a headlight reconditioning kit or a handful of items from the local hardware store. The basic process involves wet-sanding the headlights with a very fine grit sandpaper or emery and then applying a UV resistant clear coat. Painters tape can be used to protect the vehicle’s paint job during the sanding and application of the clear coat, and the sanding can be done by hand or with a power tool. When done properly, restoring your headlight lenses can result in a noticeable increase in brightness whether or not you also replace the headlight capsules. HID headlights are much brighter than your typical halogen bulbs. These headlights still use capsules, but you can’t just drop HID capsules into a car that came from the factory with halogen bulbs. In fact, this upgrade can actually require some basic electrical wiring work in addition to replacing the headlight assemblies. The most basic type of HID headlight upgrade involves installing or wiring a ballast and then replacing the stock capsules with HID capsules. This is technically possible in some cases, but you may end up with a poor beam pattern. In a worst case scenario, this may leave you unable to see at night while also blinding other drivers. The general rule of thumb is that if your car had headlight reflector assemblies, as opposed to projectors, dropping in HID capsules is a bad idea. The way to get around this is to replace your headlight assemblies with projectors. You may also be able to find HID headlight assemblies that include the necessary ballasts and also create a sharp beam pattern that allows for great night vision without creating excessive glare or blinding anyone. LED headlights are also brighter than halogen, and vehicles that actually come with LED headlights don’t necessarily conform to the typical pattern of capsules inserted into housings. That said, LED headlight capsules are available as drop-in upgrades. When upgrading from halogen to LED headlights, you can run into some of the same problems encountered when upgrading to HID. The issue is that while direct-replacement LED capsules do exist, they don't necessarily work that great in every application. Even if an LED headlight capsule meets the basic specifications of the halogen capsule that it is intended to replace, the light it produces will tend to interact with the headlight assembly in a different way. This is usually a bigger deal when you're working with reflector assemblies than it is if your car came with projectors. If your car did come with projectors, you may be able to drop in LED capsules and enjoy bright, cool light with a crisp beam pattern. You may also be able to find projector assemblies, or a total LED headlight conversion kit, depending on the vehicle you drive.